Merging two companies into one multi-floor business location provides opportunity to reinvent everything from hierarchies to design aesthetics. AmGeneral Insurance came into being when general insurance provider AmG Insurance united with Malaysia’s leading automobile insurer Kurnia Insurance (Malaysia). 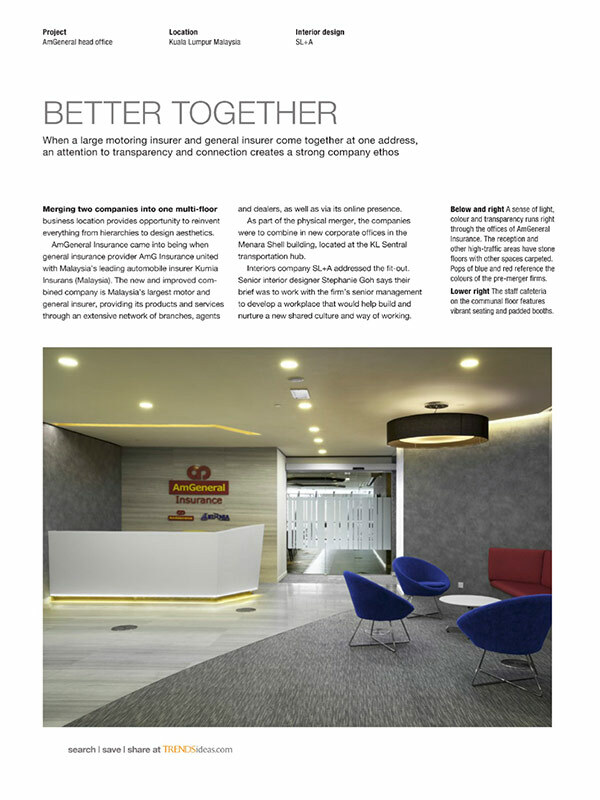 The new and improved combined company is Malaysia’s largest motor and general insurer, providing its products and services through an extensive network of branches, agents and dealers, as well as via its online presence. As part of the physical merger, the companies were to combine in new corporate offices in the Menara Shell building, located at the KL Sentral transportation hub. Interiors company SL+A addressed the fit-out. 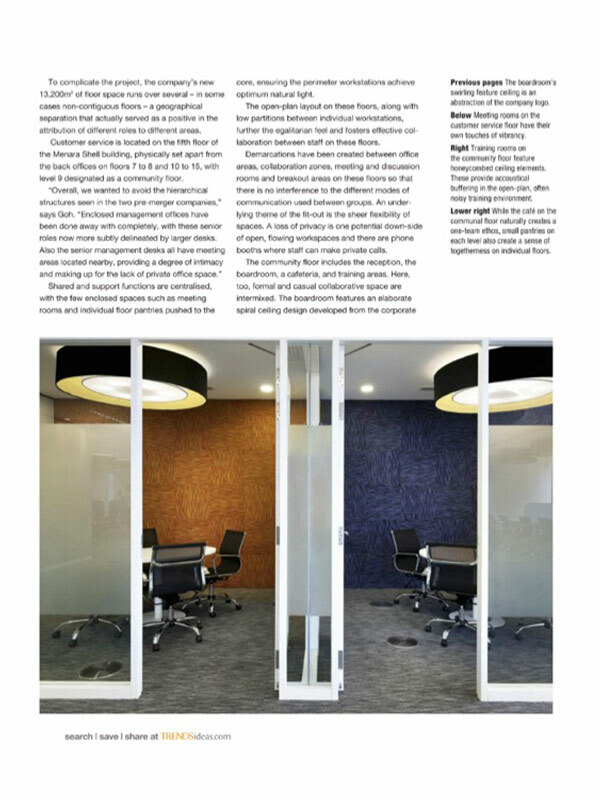 Senior interior designer Stephanie Goh says their brief was to work with the firm’s senior management to develop a workplace that would help build and nurture a new shared culture and way of working. To complicate the project, the company’s new 13,200sm of floor space runs over several- in some cases non-contiguous floors- a geographical separation that actually served as a positive in the attribution of different roles to different areas. Shared and support functions are centralized, with the few enclosed spaces such as meeting rooms and individual floor pantries pushed to the core, ensuring the perimeter workstations achieve optimum natural light. The open-plan layout on these floors, along with low partitions between individual workstations, further the egalitarian feel and fosters effective collaborations between staff on these floors. Demarcations have been created between offices areas, collaboration zones, meeting and discussion rooms and breakout areas on these floors so that there is no interference to the different modes of communication used between groups. An underlying theme of the fit-out is the sheer flexibility of the spaces. A loss of privacy is one potential down-side of open, flowing workspace and there are phone booths where staff can make private calls.